Because it’s such a visually distinctive movie, it’s a lot of fun to try (and mostly fail) to draw. I recently heard a Pixar lighting director say that she likes to work lighting and color schemes from “Blade Runner” into the movies she works on. So if there are scenes in “Ratatouille” that make you think of replicants, that’s why. You’re walking in the desert. You look down and see a tortoise. He’s playing FreeCell. You begin to move cards. You’re not helping. Why is that? What do you mean I’m not helping? Describe, in single words, all the good things that come to mind about your user. I think I was supposed to draw a PC in the top illustration, but I drew an iMac instead. It’s the computer I had at Viz at the time. Artie is cast as the analyst, making this a pretty weird illustration, out of context. The horrible collage of hand coloring, Photoshop fills, cut-and-paste, and lens flare in the second illustration almost looks appropriate for a cyberpunk story, actually. I’ll just pretend that I drew this in 1994 or so. I’ve retained this strip’s original alt-tag dedication, “This strip is dedicated to Pugilism and the Third Autistic Cuckoo,” because I think it sounds cool. It’s a band name from Dirk Gently’s Holistic Detective Agency, although I notice that this page on narbonic.com is one of the first things that comes up in a Google search for “Pugilism and the Third Autistic Cuckoo”. That’s pretty impressively tenacious, especially considering that, as I mentioned before, this page hasn’t been directly accessible from the archives for several years. Replicants are like any other machine. They can be a benefit or a hazard. If it’s a benefit, it’s not my problem. Have you ever reformatted a human by mistake? Davenport blinks… …hesitates before answering the question. Just Regis Philbin. So far, no one’s noticed. She’s beginning to suspect, I think. Suspect! How can she not know what she is? Well, we began to notice in them a strange obsession. In Mell’s case, she keeps wanting to play Quake. She’s been using real ammo. We lost half the marketing staff earlier this week. She thought they were bots. Seen things you little people wouldn’t believe… bug-free programs that were user-friendly… I surfed the web and found sites with rich content that glittered in the dark near the Geocities sector… I even found a decent script for a movie starring Tom Green. All those things… they’ll be gone. … very dork moment for me here. 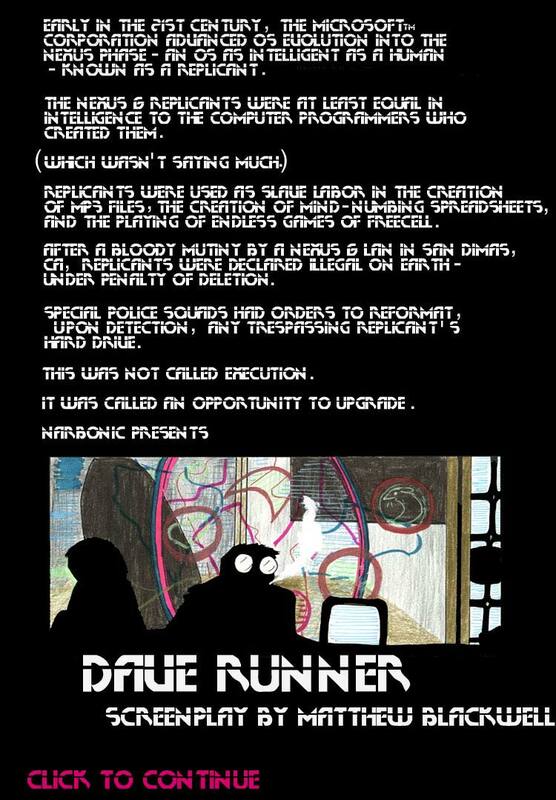 I just realized this was the orginal cut of dave runner.